Today's giveaway is brought to you by Jillian from creative.manifestations! This is one of my very favorite Etsy shops, and is especially dear to me because it's where my first Etsy purchase came from! Jillian is giving away a very fun necklace from her shop called "a bit of whimsy". An adorable old fashioned bicycle in antique brass paired with textured antique brass chain makes for the perfect bit of whimsy to your day. For a chance to win, please visit creative.manifestations and leave a comment below. A winner will be chosen at random tomorrow! I love this bicycle, it's so much fun! I checked out creative whimsey and everything is so unique, yet classic at the same time. Love the cameo necklace. So much cute stuff! I like the "delicate treat" necklace! Oh my goodness. I just must have this necklace! It's splendid! And I've fallen in love with her shop. I need it all. A particular favorite is the 3 owl necklace, as I have a thing for owls. She's so creative. I love it! I like combining the mechanical stuff with the delicate jewelry. Wow, Jillian's jewelry is awesome! 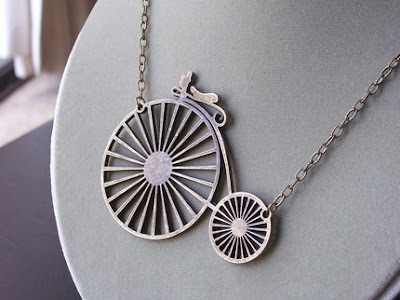 I love the pieces that look like gears, and I love the pirate ship pendant. Thanks for letting us know about her stuff! Love the vintage flair of this necklace! I hearted this etsy shop. So many wonderful trinkets. I especially love the Subtle Threat necklace. My kind of humor. But I would adore winning this necklace just as much!!! Love it! That is seriously adorable. This is such a sweet and fun necklace! People never cease to amaze me with their brilliant creativity! Great necklace. I love your Etsy Shop...will have to fave a thing or two :) I can't help but be absolutely enamored with the dash necklace. Talk about a conflict...ruffles and industry...love it! oh wow, how cute is that?! Thanks for directing us to creative.manifestations Lots of interesting things there. I know it will become a favorite of mine. I'm buying one other for my twin's birthday next week. Wouldn't it be fun to wear this lovely piece out with her when we meet in New Orleans the end of next week! ... and I cannot find your email anywhere. Sorry for being so retarded. Ooo I love the Sophia Necklace!!! I hope I win! Awww...that is so cute! Lovely blog! Im sad i missed this!! LOVE that necklace!